Microsoft and Nokia are currently holding developer events alongside the Windows Phone User Group at Modern Jago in East London. Microsoft has rented it out to provide a central location for all platform exhibitions and events to take place - it's a superb building. Back in December, at a recent WPUG meetup and AlphaLabs event, those who attended witnessed a row of white Lumia 920 Windows Phones on one side of the main conference hall. These handsets were each running an interesting app, more on this in a minute. Modern Jago has become the place-to-go for developers and designers to collaborate and share ideas. Videos, articles, infographics, events, showcases and more will come out of AlphaLabs, which will provide the developing community a platform for not only presenting work, but also locating support and like-minded folk. While Windows Phone is of course the focus for AlphaLabs, other platforms are also covered along the way. The Always-On Telephone Club exhibition itself saw an app loaded on each of the Lumia 920s on show. This app (designed by Arcarde) would show a map of nodes, which represented each of the Windows Phones. One of the nodes on each handset were a different colour, dictating the node attached to that particular Lumia 920. Moving this node would reproduce the movement on all other handsets. With multiple users moving nodes, one could imagine the cool effects that could be created. The system at work is called a Node Garden, which many of the developers took away to create their own interpretation or expand on what's already available. Matt Lacey (the developer and brains who runs the Windows Phone User Group) also crafted a tile-like version and explained the his work in the video above. A number of the node gardens, including Note Garden by KeyboardP, were presented to attendees of an AlphaLabs event later in December. As mentioned above, we were present at the WPUG event where the exhibition and app was featured. Nokia and Microsoft decided to not tease attendees with the handsets on show, since no one could find a Lumia 920 to purchase, and handed out one to every developer who received a stamp on their hand. Our own Jay Bennett was provided one, which (as one could imagine) made his day. For everyone else who didn't receive a stamp, one could apply for one should they be developing apps for the platform, which is what's already presently possible. 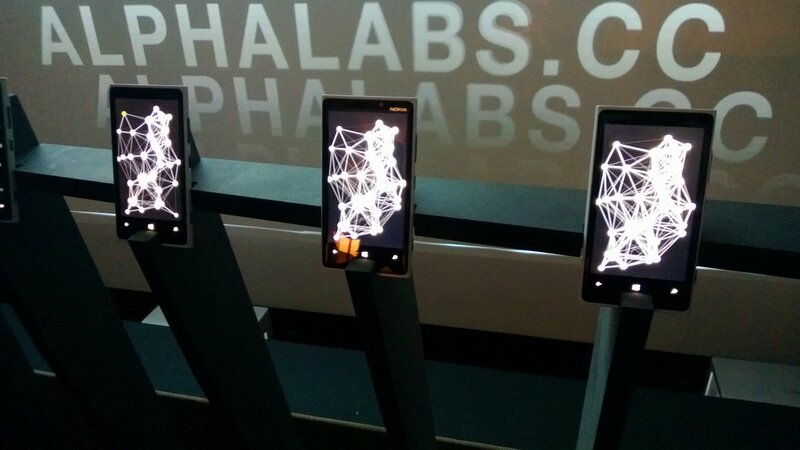 If you're looking into or have already started to develop for Windows Phone we'd strongly urge you to check out both AlphaLabs and the Windows Phone User Group. We're present at the latter events every month where we'd like to get in touch and help out developers with app exposure and reviews. We'll hopeully see you there.